The workshop will consist of a series of experiments to make and purify C60, buckminsterfullerene. Displays of the latest work, applications and novel properties of this fascinating new material will be presented, along with many structural models. Some of the experiments will actually be made on the 'historic' apparatus first used to make C60 at Sussex University. Acknowledgements I would like to thank the following people for there kind help during this project; Adam Darwish, David Walton, Harry Kroto, Roger Taylor, Paul Birkett, Mauricio Terrones and Tim Metham (Sussex), Sue Allenby and Roger Brown (SATRO), Peter Pye, Trevor Price-Jones (University of Hertfordshire), Sarah Hogben, Jan Meering + students of the fullerene group at the Angmering school (Worthing, West Sussex). The following experiment describes the way to make buckminsterfullerene. The apparatus you are about to use is the original machine that was used to make the first quantities of C60 at Sussex University in 1989 - 90. A quick description and demonstration of the apparatus will be given before you undertake the experiments. The following notes were therefore written as a guideline only. Also see the posters. 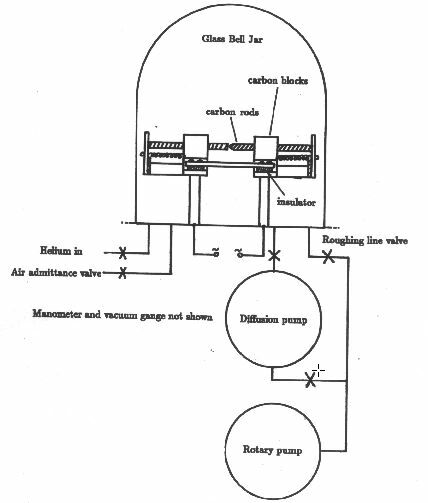 Remove the glass bell-jar and if necessary fit some new carbon rods as described during the demonstration. Also arrange the KBr plates to within 6-7 cm from the rods. Pump down the system (see the demonstrator) and introduce Helium gas into the chamber. Repeat (purge). Finally fill the bell-jar with about 100 Torr of Helium. Connect up the welding kit power supply (NOTE: the welding kit power supply is a high current, low voltage supply and therefore there is little risk of electrical shock, however care should be taken as with any other 240 v mains operated device). Turn the on / off switch on the supply to the on position for 10 to 15 seconds. Afterwards there should be plenty of black soot like material produced inside the bell-jar. After a 5-10 min cool down period fill the bell-jar to atmospheric pressure. Take the bell-jar off and scrape the glass surfaces clean, collect all the material. Believe it or not, 10 % of the soot should be made up of C60. Take the soot covered KBr plate and measure the IR spectrum as directed by the demonstrator. You should be able to observe the tell-tale signs of C60, i.e. four weak absorptions on top of the larger absorption (see below). Most molecules absorb in the Infra-red (IR) and the number of absorptions is dependant on the number of atoms in the molecule and how symmetrical the structure of the molecule is. In general an N atom molecule will have about 3N absorptions in the IR. As the symmetry increases the number of IR absorptions falls. For a molecule having 60 atoms one would expect 3 x 60 = roughly 180 IR absorptions. However because of the unique symmetry of Buckminsterfullerene, C60 has just 4 IR absorptions. This incredibly simple spectral fingerprint for C60 made IR spectroscopy a particularly effective method by which to probe for C60 in the arc made materials. We are going to use this technique to check that the carbon arc materials have C60 present in them. Place as much of the collected soots as you can into a small flask. Add 20-30 ml of toluene and stopper the flask. Shake gently. Is there any colour change ? Next filter the solution. What colour is it ? You have just extracted the fullerenes from the soot. The coloured solution is due to a mixture of C60, C70 and larger fullerene cage molecules. Congratulations ! The next step is to purify the mixture of the fullerenes into separate fractions. We do this using chromatography, which is the basis of the next experiments. To do the chromatography properly we need quite a lot of soot extracted solution. It would take too long to use the bell-jar apparatus to make the fullerenes required for the next experiments, so we are going to use material that has been made in exactly the same way (although in much larger quantities) a few weeks ago. The chromatographic separation and purification of the fullerenes was first achieved at Sussex University soon after the carbon arc technique was discovered. Separation of pure allotropes by chromatography is believed to be unique to fullerenes. A quick demonstration will be given before you undertake these experiments. The following notes are therefore as a guideline only. Also see the posters. 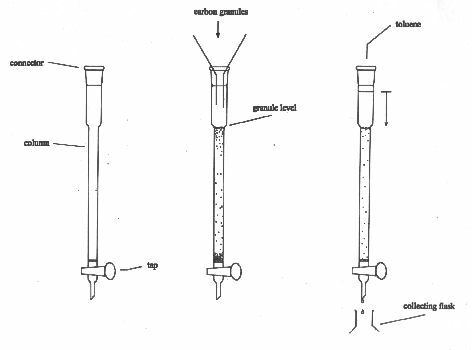 Fill the column, to the level shown, with the carbon granules (using a funnel). Add some toluene (using a different funnel) and allow the solvent to drip out of the bottom of the column into a 100 ml flask. Continue until the level of the solvent falls to the height of the carbon granules. 2)	Stopper the flask and shake gently for about 20 seconds. You should get a deep red solution. 3)	Pour the solution into the dropper flask (check that the tap is closed first !). 4)	Connect the dropper flask to the top of the column. Open all the taps and collect the drops in a clean flask. 1)	Collect the drops from the column and every couple of min pour the collected solvent into the waist bottle. When the colour of the solvent starts to change, collect all the solvent in the same flask. 2)	The hand pump can speed up the process if necessary. 3)	Eventually the level of the red fullerene mixture will fall below the carbon granules. Turn all the taps off. Refill the dropper funnel with fresh toluene. Open all the taps and continue collecting the fractions. 1)	After 20 - 30 min the magenta colour of pure C60 will appear and should continue for a further 20 min or so. 2)	When the colour disappears from the solvent allow the remaining toluene to fall to the carbon granule line. Then add dichlorobenzene to the dropper flask. Continue collecting fractions (use another flask). 3)	After a while the red C70 fraction will appear. You have now successfully separated C60 and C70 from the fullerene mixture. 4)	Let the dichlorobenzene pass through the column and leave to drain. Everyone knows that diamonds are sparkling gemstones, and that graphite is the 'lead' in pencils. What is little known, and at first rather strange, is that these vastly different materials are actually made up of the same atomic building blocks - carbon atoms (ie. they are allotropes). Why are they so different ? The answer to this apparent contradiction was actually found almost a hundred years ago when scientists probed the materials with X-rays to determine their internal atomic structure. It turns out that the atoms in diamond are arranged in a rigid 3D structure, while the atoms in graphite are arranged in sheets of atoms. In graphite these sheets can move over each other fairly freely (see the picture over the page) but in diamond the atoms are held rigidly. Diamond is therefore hard while graphite is soft. Further analysis along these lines also explains why diamond is an insulator and crystal clear, while graphite is a conductor and opaque. People have been using diamonds and graphite for thousands of years, proof of this comes from the names which are derived from the ancient Greek. Diamond means 'invincible' related to its hardness, the hardest naturally occurring material. Graphite means 'to write' obviously this name was applied to an early use of the substance and we still use graphite today in pencils. Diamond and graphite are most important industrial materials. Diamonds can be mounted on to drill bits to extend the working life of the tip and allow them to cut into extremely hard materials. Graphite is used extensively in the manufacture of motors, heating equipment and electronic components. It is apparent that diamond and graphite are important materials. In fact the study of carbon materials is an extremely important area of research. The discovery of a third form of carbon would therefore caused a great stir in the scientific community if it were true. The brief story outlined below describes this new third form of carbon; buckminsterfullerene (more commonly called C60) and indeed it has caused an explosion of activity throughout science. Buckminsterfullerene is a tiny molecular cage of carbon having 60 atoms making up the mathematical shape called a truncated icosohedron. You actually know the shape of this structure very well because it happens to be the same shape as a football ! (12 pentagons and 20 hexagons count them). The experiments made during this workshop will allow you to make, analyse and purify C60 yourself. Buckminsterfullerene - a strange name ? 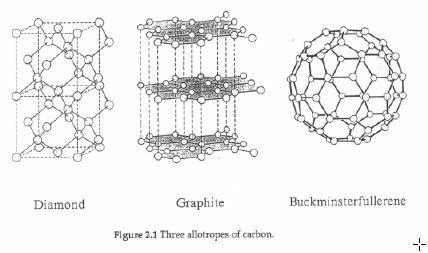 The round cage like structure of the fullerenes was reminiscent of the dome structures designed by the architect Richard Buckminster Fuller, and so C60 was named Buckminsterfullerene. These amazing buildings can cover large areas of land and the light weight and durable construction makes them ideal structures especially for building that have to withstand large changes in temperature and high winds such as found in the Arctic, for example. They also make good climbing frames and many small fuller type domes can be seen in playgrounds. 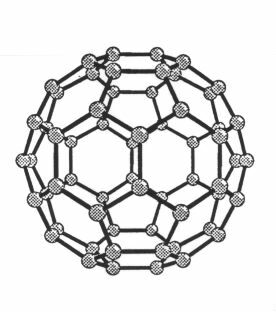 C60, buckminsterfullerene, and a whole family of carbon cage molecules called the fullerenes, were first discovered in 1985 on a very sensitive laboratory instrument. The amount of C60 actually being produced in the experiment was very small. The scientists calculated that, even if the machine was run for ten years non-stop it would barely produce enough C60 to line the bottom of a test tube (a few milligrams perhaps). C60 was therefore initially discovered in microscopic amounts at levels too small to allow purification and analysis by any other techniques. However, from 1985 - 1990 the theoretical scientists started to calculate the physical and chemical properties of these curious molecules. The next scientific breakthrough came in 1990 when a German / American group and the Sussex group independently showed that C60 could be made in gram quantities using a carbon arc. The technique is essentially very simple; if a voltage is applied to two carbon rods, (just touching), an arc will develop between them. If the arc is maintained in helium or argon (instead of in air) clouds of black smoky carbon soot are produced. It turns out that at the correct arc temperature and gas pressure up to 10 % of the black soot is C60. Also present in the soots are 1% C70, and smaller quantities of larger fullerenes. The fullerenes are also found to be soluble in common solvents such as benzene, toluene or chloroform. If you shake up some of the fullerene soot with toluene and filter the mixture, one obtains a red solution. If you take a drop of this solution and place it under microscope, as the solvent evaporates, crystals of pure carbon appear in front of your eyes. These crystals are made up of millions and millions of tiny balls all packed together side by side and on top of each other. The beautiful pictures obtained using high power electron microscopes dramatically confirm this. Now the world has a method to make these fascination new carbon molecule we have started to investigate their physical and chemical properties. With the development of this incredibly simple technique the field of fullerene research has grown at an alarming rate. There are now thousands of articles and scientific publications on the fullerenes and it looks as though the new field of fullerene science is here to stay. Yes !, soon after the discovery that the fullerenes could be made in the carbon arc other interesting carbon structures were discovered lurking in the carbon soot. Electron microscopes have uncovered tiny carbon tubes ('buckytubes'), some having diameters as small as 2 nm or so, many are thousands of times as long as they are wide. Carbon 'onions' have also been found and these can be considered as carbon cages one inside the other, rather like a carbon version of the Russian doll toy. These carbon particles have many millions of atoms and some have been observed with dozens of concentric shells. The tubes and onions are likely to be composed of hexagonal and pentagonal carbon rings just like the fullerenes. However it looks as if structures having heptagonal (7 member) rings may also be possible. 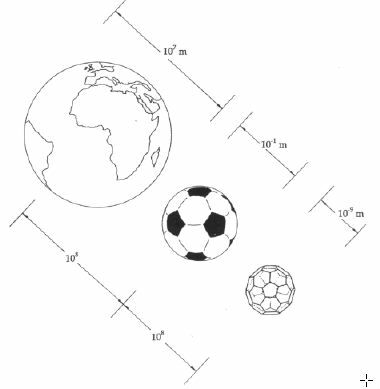 One such hypothetical structure is shown on the second page of this booklet. These nanoscale fullerene based structures (fullerenes, tubes and onions) represent a new range of carbon materials - materials destined to play a role in the technology of the 21st century. For further information etc. see contact name and address on the acknowledgements page. 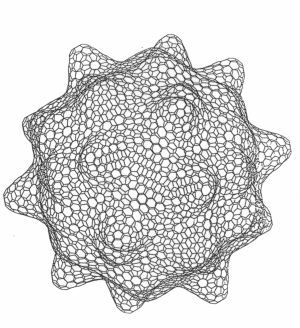 The story of the discovery of the Fullerenes, from searching for chain molecules in space to some of the most important developments in Fullerene science. The story of the discovery of C60 etc. etc. with emphasis on Fullers architectural domes etc. another good read. A really great book on the latest excitement in chemistry, all about the research at the frontiers of chemistry (which naturally also contains physics and material sciences etc.). 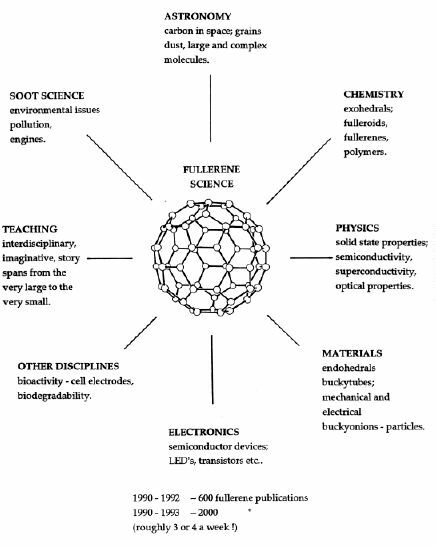 there's also a section on Fullerenes.